I have a confession to make ... I am an egg-aholic. 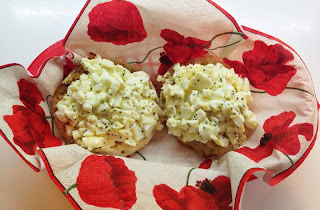 Seriously, I eat eggs every day and my love for egg salad leans towards the extreme. There are endless variations of recipes out there and I have tried many of them, but this one is my favorite. I like its simplicity and the poppy seeds add just a touch of sweetness. I'm not a fan of egg yokes and have to watch my cholesterol, so I use only one yolk to give the dressing a the rich taste, without making it heavy and keeping this recipe light. And, the quality of the ingredients makes all the difference! Especially the dijon mustard -- I'm a huge fan of Maille dijon - no other dijon even comes close. This mustard is so good, I can eat it by the spoonful out of the jar. I highly recommend trying it. I also bought an egg slicer after trying my mom's and realizing it was a huge time saver since I make this so much (at least twice a week). Not sure if I should admit that! My favorite way to eat egg salad is on an open-face, toasted english muffin. The cornmeal-crusted crunch is the perfect pairing with the egg salad! Place eggs in a medium saucepan and fill with water until eggs are just covered. Bring to a boil; immediately remove from heat and cover. Let rest for 11 minutes. Drain water and place eggs in a medium bowl. Cover eggs with ice and fill bowl with water until eggs are cover. Place in the fridge and cool for minimum 1 hour. To peel eggs, roll on kitchen counter to crack shell. Run under water and peel off the shell. Slice each egg and remove the yoke. Place one yoke in a small bowl and either discard or save the remaining yokes for another recipe (dear Mom, please pretend you didn't just read that I said "discard" food). Using a fork, smash the egg yoke until it is fine crumbs. 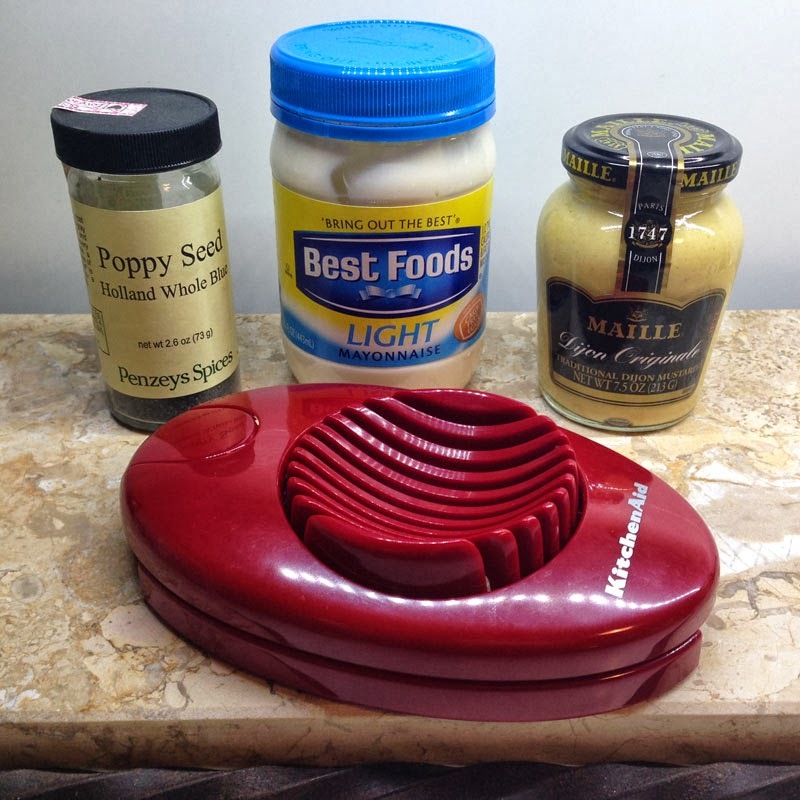 Add mayonnaise, mustard, poppy seeds, salt & pepper. Mix well with fork or whisk. Chop the egg whites and place in a medium bowl. I prefer mine chopped fine, but to each their own. Add egg yoke mixture to chopped egg whites and stir until well blended. For the easiest peeling hard-boiled egg, the method I described above is the best I've found. Something about immediately immersing the eggs in ice water to cool helps the shell release from the egg. 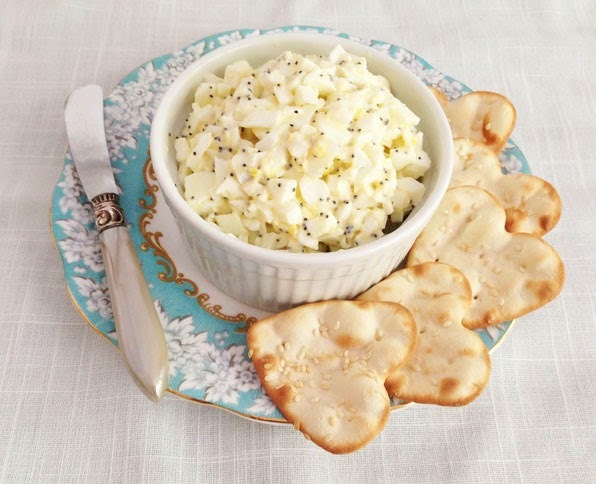 I'd love to hear if you have a favorite egg salad recipe or another great method for an easy peeling hard boiled egg. Please drop me a line or post a comment.